Carte d'Artois et des environs, ou lon voit le Ressort du Conseil Provincial d'Artois. 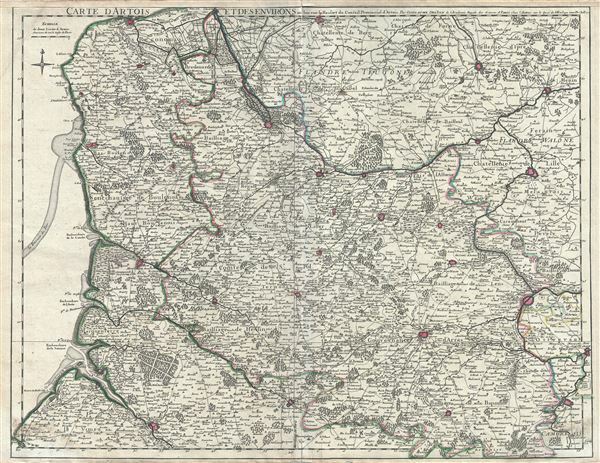 This is a beautiful 1711 Guillaume De L'isle map of Artois region and its environs in northern France. It covers from Calais to Bouchain and from Abbeville north as far as Gravelines. Includes the southwestern parts of modern day Belgium. The map renders the entire region in extraordinary detail offering both topographical and political information with mountains and forests beautifully rendered in profile. Artois is former province located in the northwestern part of France, bordering Belgium on the north and Picardy to the south. This roughly corresponds to the modern department of Pas-de-Calais, and includes the prominent cities of Arras, Saint-Omer, Lens and Bethune. When this map was made, this region was part of Southern Netherlands was successively under Spanish and Austrian rule, until in 1795, Napoleonic forces invaded and set up a new French client state, the Batavian Republic. This map was created by Guillaume De L'isle in 1711. Very good. Minor wear along original centerfold with sight creasing near bottom margin. Lower left and right quadrants exhibit minor foxing. Original platemark visible. 1747 map of France by Philippe Buache pasted on verso.